There can only be one photograph I can choose from June, 2013, and that is this one of my little boy James doubting what his daddy tells him and needing to check for himself. When the long nights of summer come in, it gets harder to get little children to go to bed at their normal time. Outside it is still daytime, there is still sunshine and there is still lots to do and lots of time left for a little boy for playing and mischief. So, when his dad brings him upstairs and gets him into his pyjamas and tells him it is nighttime and that little boys must go to bed now, that little boy has to doubt it. – But it is not dark, daddy! – It is, James, it’s bedtime now. Come on. – No! It’s not. It’s still daytime. Look. 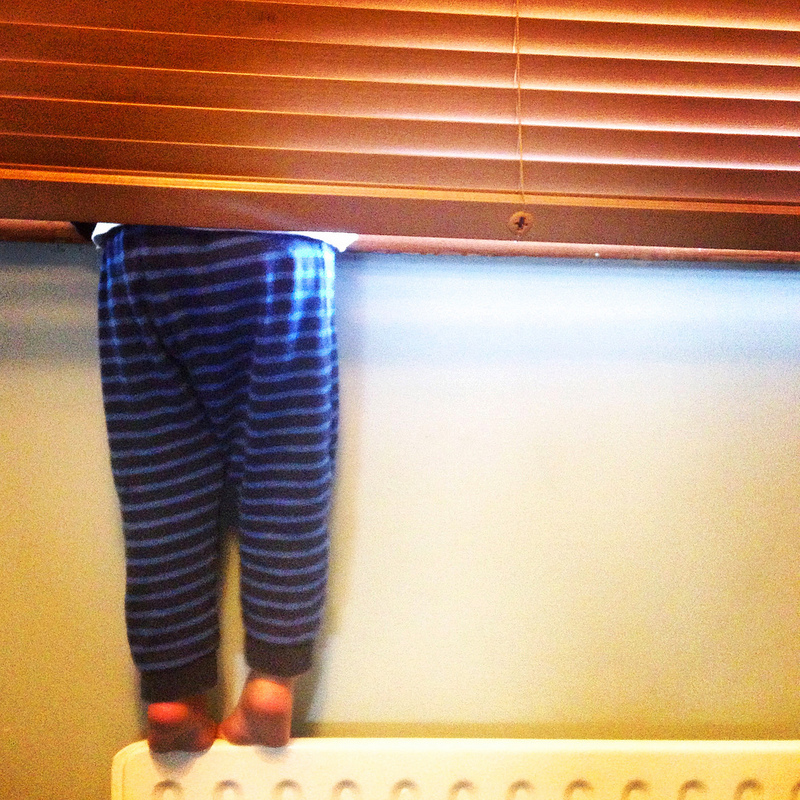 Then he wriggles free and runs across the bed, stands on his little tipitoes on the radiator, pulls the blinds up and over his head and peers out and of course he is right. – It is not nighttime! It is not, Daddy. – But it is bedtime, James! I was delighted for two reasons. One, because he being a little rebel and I love that. Why should he not doubt what I am telling him? I hope he doubts me more and more. I hope he corrects me and helps me to learn as time goes by. And secondly, I love it because it made for a great photo opportunity. So, my little rebel, continue to check things for yourself. And that’s June! This entry was posted in A Flickr Year, iPhone, James, My own favourite photographs, photograph posts and tagged art, Brendan Ó Sé, cork, End-of-year review, flickr, Flickr Favourites, iPhone, iphoneography, June 2013, learning, love, photography, rebel, Son, Up the rebels.